With a tiny mouse like wail, my world was forever changed. This past year has been a whirlwind of diapers, and giggles. We have grown as a family and as individuals. A year ago, I was going in to the hospital to see if they could manually turn my breach baby. I was terrified because a week prior they had tried, and it hurt SO much! Jeffrey and I dropped Beth off at my parent's house after the kids went to school, and we went up to the hospital. The doctor walked in and said the baby had turned on his own, so we decided, rather than risk him turning again, I was far along enough that I could have the baby that day if I wanted. And so my midwife broke my water and started me on petocin. And into my world burst the happiest, sweetest little boy ever born. I realize I really didn't blog much this past year, and I certainly didn't post about babyhood for that darling and precious little guy. So I am going to try to get caught up. Vince was simply the best baby we have had yet. He started sleeping through the night at 2.5 months. I was overjoyed, and well rested, which had never happened before in the history of my career of motherhood. Vince laughed and smiled and played a lot. He is simply a delight all around! 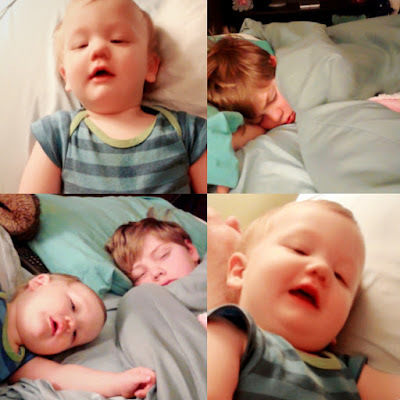 In September he got croup and that interrupted his sleep patterns. At that point, he quit sleeping through the night. I was very sad, but felt I couldn't complain too much, as I had been spoiled essentially the first six months of his life. Right when he was beginning to sleep well again, he got sick again. RSV this time. Not to be confused with the terrifying land you in the hospital RSV, but just a really bad mucusy sick. And then he got an ear infection. This was January. I am happy to report, though, that for the most part, he is back to sleeping through the night. Because that is obviously what I cherish. A good night's rest. But there is far more than sleep that my little man brings to us. Last night, I was cleaning late into the night because I have been so tired lately, I just have a hard time getting it done during the day. But that is neither here nor there. The point is, I was up cleaning. And Beth decided to get up. She lay on my bed, whining while I picked up things on the floor and vacuumed, Les Miserables playing in the background. I slowly made my way to vacuum the clear parts of my floor as they emerged. And then, Vince woke up. He cuddled for a bit, his hand in his "special pocket." When he is tired, he insists on putting his had down the front of anyone's shirt. He prefers cleavage, but if Jeffrey is holding him, his shirt front will do as well.After a bit, Beth's giggles woke him up and he decided it was time to play. Which had put a bit of a stop to my cleaning. And I was again reminded why I rarely get much cleaning done when he is around. But he giggled, and followed me around, chasing the vacuum, trying to steal anything I was attempting to pick up and put away. He then began playing peek-a-boo with Beth over the edge of the bed. By this time, it was nearing 2 am. I was exhausted! After many pleas to Jeffrey who had been down in his office, he took pity on me and came up, taking Vince so I could get our bed cleared off, Beth back to her bed, and myself happily tucked in. We have recently discovered that the baby is a bottomless pit. He is always eating, and always hungry, and part of the reason he has started to wake up in the night. We try to stuff him full before he goes to sleep, but those nights when he wakes up, and I can't rock him back to sleep, so I lay him next to me, and he spends the majority of the night kicking me in the face, and tossing and turning. For some odd reason, when sleeping in my bed, the boy must have his feet in my face, or he is not comfortable and cannot sleep. I am happy that he can sleep, but it makes it incredibly difficult for me to get any shut eye. The other night I had gone to bed at 10:30, he woke up at 1, and by about 4, I was just done. I was so tired and irritated with having been repeatedly kicked in the face. Jeffrey was an angel and about 4:30 he picked Vince up, took him into the kitchen and gave him some food. Beth had awakened as well, of course. Those two are as thick as thieves! Anyway, he fed Vince some cheese and bread, gave him some water, and then brought him back to me so he could get ready for work. And the boy passed out, cuddled up on my arm. I did some ninja mommy moves and transported him back to his bed, convinced Beth that if she were to continue whispering she would have to go back to her own bed, and then... it was time to get up anyway because the older kids had school. The moral of this story, though, is the baby likes to eat. He actually seems to eat more than me! I am not sure where he puts it, but that little body is continually chomping down on something, or trying to, anyway. When he has a completely full tummy, he sleeps a lot better. So, before bed we focus on things like mashed potatoes, cheeses, anything with high fat, that is filling. It seems to have helped so much! Vince loves going places. I mean he really loves it. When we are walking into a store, or anywhere new, he gets very excited and starts waving to everyone in sight. He squeals, kicks his little legs, and does a sweet little greeting, bringing a smile to everyone who sees him. That little guy just makes my heart pitter patter. Also, I love that he loves outings. It makes them so much more enjoyable for all of us, and we love our outings! Vince is trying to walk. He basically has it down. He has for a long time. He just lacks the confidence. A lot of times he will take a few steps, then raise his arms in triumph and shout, "Yay!" He is doing quite well with talking, and with understanding me. He points at the picture of the temple in my bedroom and say, clear as day, "temple!" When I call for Beth, he will imitate me, and yell "Be-eh!" He also tries to call for Keith and Faye. It is adorable! I love love love his nose scrunch. There is nothing more adorable in this world than Vince and his little grin with the scrunched up nose. He is so lovely, and will tackle you with hugs. His favorite toy right now is a ball, though he does love duplo and building blocks as well. Oh mercy, I could go on and on about this little munchkin of mine, but I would much rather spend my time loving on that little crazy goof ball. Happy birthday, Mister Vinster! You have changed the world and mine is a better world because of you! I sure enjoyed this blog entry! Keep it up!